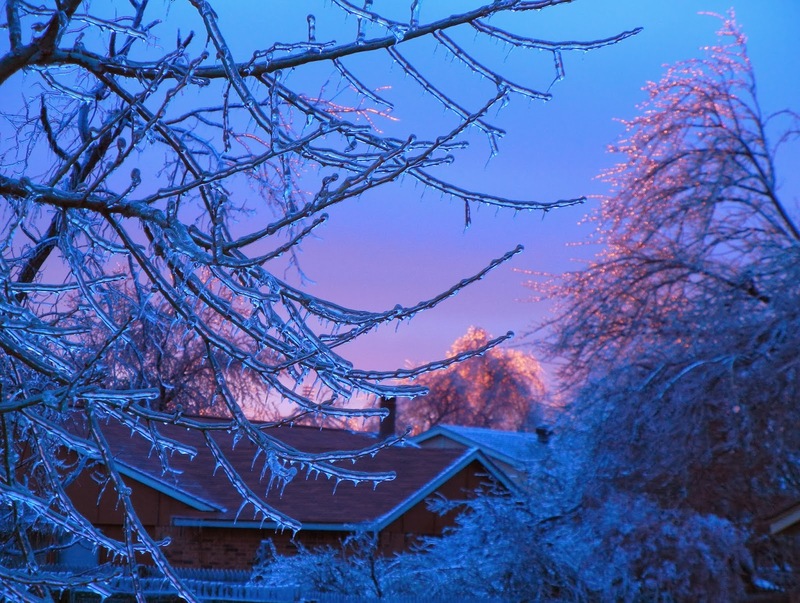 A sunset sparkling in ice coated trees at the end of 2013. Since last I wrote here, I've made a lot of sales with my online business, and I've handled a lot of books at my library job (a lot of books! ), and I've edited a lot of words on a lot of papers (too few of them being my own in such busy times), and I've been very sick with two different illnesses that sidelined me when I wasn't working. It has been a rather dizzying two months of work, with very little to blog about, and most of the time, no energy or time to do it, anyway. I've been tired...so very tired. But, God has been very good to me throughout the season. If I forgot that, I would be like the Israelites grumbling about a full stomach of manna. Last year, I prayed at the beginning of the year and felt God telling me that 2013 would be a year of finishing things. That was fulfilled, sometimes in ways I wish had not come, and sometimes in great ways. I have new connections and ideas about how to finally advance my career, and in a backward kind of way, I would say I've learned a lot about the writing industry through my work at a library. But am I fully satisfied and getting everything out of life? Frankly, no, I couldn't say that about myself in 2013. As I pray about 2014, I am reminded that work, in itself, doesn't bring joy or fulfillment. Every human being yearns for a deeper purpose than their next paycheck or the end of their next project, or reaching their next career milestone. This year, I want to get more out of life than just work. I want to finally pursue my dreams in a more focused way than I have formerly done, and use my talents for God and for the edification of others. I don't know how I'll do that, except that I know I've been called to write, and I've been letting work get in the way of doing that adequately. Maybe you are feeling the same way about something in your life right now. If so, I suggest that you look into it, pray about it, and seek God's will for your life. I know that God gives us all a deeper purpose, but we have to get it from Him. We can't give ourselves a purpose, and we can't let other people be our purpose, or define our purpose for us. What we need to find is that road that God made for us to travel--the plans He has made for the individual believer (Ephesians 2:10), which showcase our talents and bring us joy and meaning on the road toward eternity. [God] has made everything beautiful in its time. He has also set eternity in the human heart; yet no one can fathom what God has done from beginning to end. I know that there is nothing better for people than to be happy and to do good while they live. That each of them may eat and drink, and find satisfaction in all their toil—this is the gift of God. We dream of Heaven, but while we are here on earth, it is a "gift of God" to enjoy what we do and feel that we have done good while we lived. So, with that, I think my resolution for 2014 is to pursue that gift of God in my life, and share my Savior with those who don't know Him. What is on your heart for this year? Have you made any resolutions like this? I'd love to hear from you!